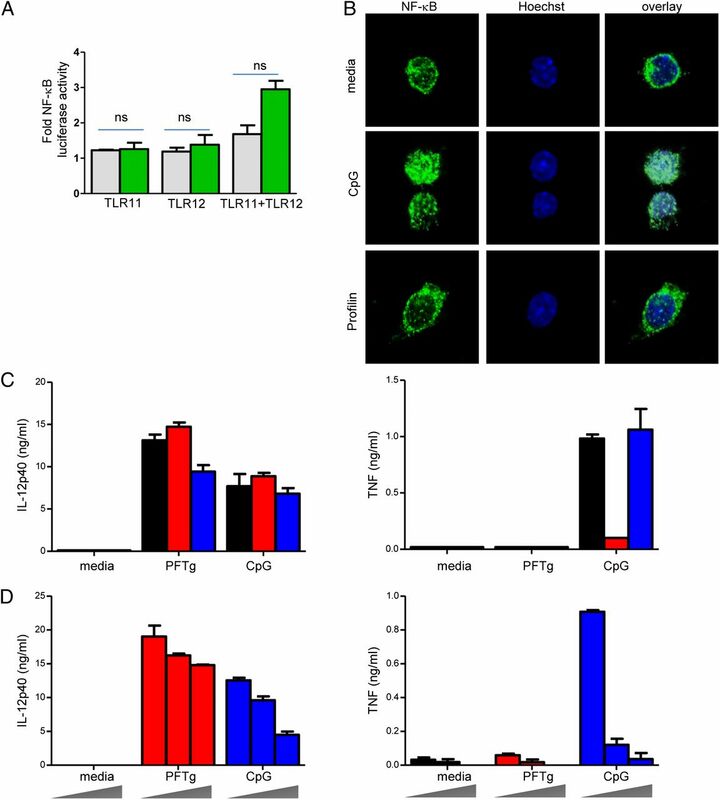 TLR12 localizes intracellularly and associates with TLR11 and UNC93B1. (A) HEK293 cells were plated on glass coverslips and cotransfected with TLR11-GFP and TLR12-mCherry. After 24 h, the cells were imaged with a Leica SPE microscope. Original magnification ×63. (B) HEK293 cells were plated on glass coverslips and cotransfected with TLR12-GFP and UNC93B1-mCherry. After 24 h, the cells were imaged with a Leica SPE microscope. Original magnification ×63. (C) HEK293 cells were cotransfected with 1) TLR11-GFP and myc-MyD88, 2) TLR11-GFP and myc-TLR11, 3) TLR11-GFP and myc-TLR12, 4) TLR12-GFP and myc-MyD88, 5) TLR12-GFP and myc-TLR11, 6) TLR12-GFP and myc-TLR12, 7) UNC93B1-GFP and myc-MyD88, 8) UNC93B1-GFP and myc-TLR11, 9) UNC93B1-GFP and myc-TLR12, 10) CD3ζ-GFP and myc-MyD88, 11) CD3ζ-GFP and myc-TLR11, or 12) CD3ζ-GFP and myc-TLR12. Thirty-six hours after transfection, the cell lysates were immunoprecipitated (IP) with anti-GFP Ab, and the immunoprecipitated proteins were analyzed by immunoblotting (IB) with anti-myc or anti-GFP Abs to detect myc- or GFP-tagged proteins, respectively. A representative result from five experiments is shown. 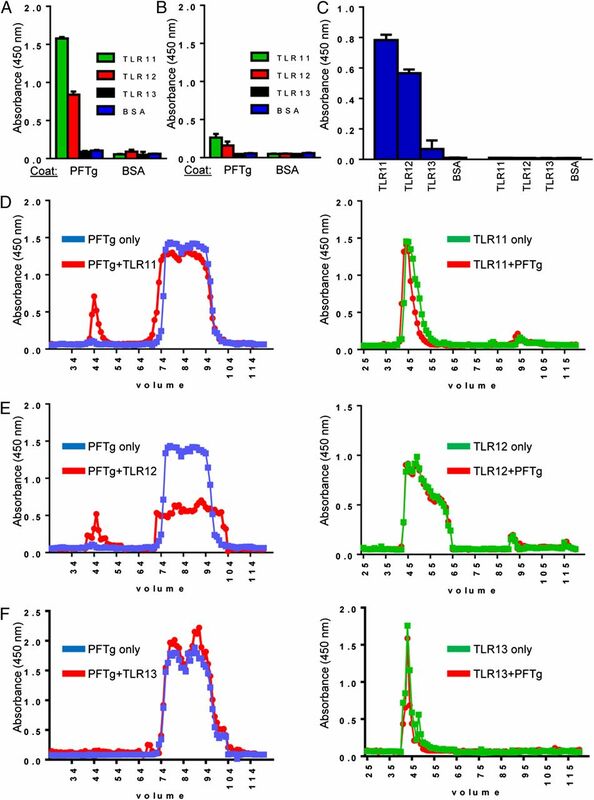 T. gondii profilin (PFTg) directly interacts with TLR11 and TLR12. (A) ELISA plates were coated with T. gondii profilin (10 μg/ml) or BSA (10 μg/ml) in 10 mM Tris (pH 6.0) and 150 mM NaCl. After blocking free binding sites with 5% fat-free milk, plates were incubated with 1 μg/ml purified TLR11 (green), TLR12 (red), TLR13 (black), or BSA (blue). Binding of the TLR ectodomains was detected with a DED-specific mAb. All ELISA steps were performed at pH 6.0. (B) ELISA plates were coated with T. gondii profilin (10 μg/ml) or BSA (10 μg/ml) in 10 mM Tris (pH 8.0) and 150 mM NaCl. After blocking free binding sites with 5% fat-free milk, plates were incubated with 1 μg/ml purified TLR11 (green), TLR12 (red), TLR13 (black), or BSA (blue). 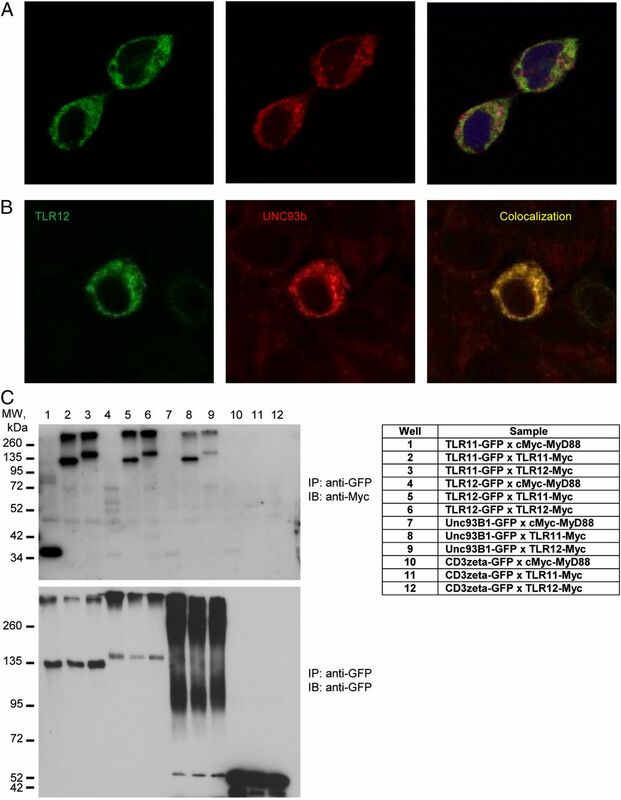 Binding of the TLR ectodomains was detected with a DED-specific mAb. All ELISA steps were performed at pH 8.0. (C) ELISA plates were coated with 10 μg/ml TLR11, TLR12, TLR13, or BSA in 10 mM Tris (pH 6.0) and 150 mM NaCl. After blocking and washing steps, recombinant profilin (10 μg/ml) was added to the wells. Profilin was detected with a T. gondii profilin–specific rabbit polyclonal Ab. All ELISA steps were performed at pH 6.0. A representative result from at least 10 experiments is shown. (D) T. gondii profilin (2 μM) alone (blue) or preincubated with 0.2 μM purified TLR11 ectodomain (red). Biochemical fractionation of T. gondii profilin or T. gondii profilin and TLR11 (red) was performed by gel filtration chromatography, and each fraction was tested for T. gondii profilin by ELISA (left). In the right panel, the T. gondii profilin plus TLR11 fractions (red) were additionally tested for TLR11 compared with TLR11 alone (green) and analyzed according to the same gel filtration chromatography procedure with a Superdex 200 10/300 GL chromatographic separation column. (E) T. gondii profilin alone (blue), T. gondii profilin and TLR12 (red), or TLR12 alone were analyzed by gel filtration chromatography as described in (C). Each fraction was tested for T. gondii profilin (left) or TLR12 (right) by ELISA. The chromatograms are representative of three independent experiments. (F) T. gondii profilin alone (blue), T. gondii profilin and TLR13 (red), or TLR13 alone were analyzed by gel filtration chromatography as described in (D) and (E). Each fraction was tested for T. gondii profilin (left) or TLR13 (right) by ELISA. The chromatograms are representative of three independent experiments. TLR12 participates in the regulation of IL-12 responses triggered by T. gondii profilin (PFTg). (A) Flt3L-derived DCs were transduced with lentiviral constructs expressing miRNA against MyD88 (blue) or TLR12 (red). After 48 h, the DCs were stimulated with 1 μg/ml T. gondii profilin, and IL-12/23p40 production was measured by ELISA 20 h after stimulation. (B) Flt3L-derived DCs were transfected with control or TLR12-targeting siRNA constructs and stimulated with T. gondii profilin. IL-12/23p40 production was measured by ELISA 20 h after stimulation. The data shown are representative of four experiments. TLR12 and TLR11 did not induce detectable NF-κB activation. (A) HEK293 cells were transfected with a plasmid encoding TLR11, TLR12, or TLR11 and TLR12, in addition to a 5× NF-κB-luciferase reporter. After overnight stimulation with 1 μg/ml T. gondii profilin (green) or media alone (gray), the cells were lysed and assayed for luciferase activity. The error bars represent the SD. (B) Purified CD8+ DCs were stimulated with 1 μM CpG or 1 μg/ml T. gondii profilin, and NF-κBp65 was analyzed 6 h after stimulation. At least 100 CD8+ DCs were analyzed in each of the three experiments. Original magnification ×63. (C) Splenic DCs were isolated from WT (black), NF-κB1−/− (red), or NF-κB2−/− (blue) mice and stimulated with 1 μg/ml PFTg or 1 μM CpG. IL-12/23p40 and TNF productions were measured by ELISA 20 h after stimulation. The data shown are representative of two experiments. (D) Splenic DCs were isolated from WT mice and stimulated with 1 μg/ml T. gondii profilin (red) or 1 μM CpG (blue) in the presence of increasing concentrations of a pan–NF-κB inhibitor BAY-11-708 (0, 1, and 5 μM). IL-12/23p40 and TNF productions were measured by ELISA 20 h after stimulation. The data shown are representative of three experiments. PFTg, T. gondii profilin. IRF8 regulates the TLR12- and TLR11-dependent IL-12 responses of DCs triggered by T. gondii profilin (PFTg). (A) Splenic CD11c+ DCs were prepared from WT, IRF8−/−, and IRF4−/− mice and stimulated with 1 μg/ml T. gondii profilin or 1 μM CpG for 20 h. IL-12/23p40 (left) and TNF (right) production were measured by ELISA. (B) Flt3L-derived DCs were generated from bone marrow cells prepared from WT, IRF8−/−, TLR11−/−, and MyD88−/− mice and were retrovirally transduced with the IRF8 (left) or control (right) vectors. Both IRF8-rescued and control DCs were stimulated with 1 μg/ml T. gondii profilin or 1 μM CpG for 20 h. IL-12/23p40 productions were analyzed by ELISA. The data shown are representative of four experiments. (C) WT or IRF8−/− bone marrow macrophages or (D) sort-purified CD11c+CD8−CD11b+ DCs were incubated with PBS or rIFN-γ (10 ng/ml) overnight and then were stimulated with 1 μg/ml T. gondii profilin or 1 μM CpG. IL-12/23p40 production was analyzed by ELISA 20 h later. The data shown are representative of four experiments. (E) WT and IRF8−/− mice were injected with T. gondii profilin (10 μg/mouse) and IL-12/23p40 production by splenic DCs was analyzed by intracellular staining 4 h later by intracellular staining for IL-12/23p40 and IRF8. (F) WT mice were injected with PBS or rIFN-γ (1 μg/mouse) overnight. The next day mice were injected with T. gondii profilin (10 μg/mouse) and IL-12/23p40 production by splenic CD8+ and CD8− DCs was analyzed by intracellular staining. The data shown are representative of two experiments. Supplemental Figure 1. TLR12 localizes intracellularly. Supplemental Figure 2. Control siRNA experiments targeting TLR11, TLR12, TLR13, and MyD88. Supplemental Figure 3. IFN-γ regulates IRF8 but not TLR11 or TLR12 expression.